Cardinal Health’s Chris Lanctot, left, awards a scholarship to third-year pharmacy student Angela O'Neil. 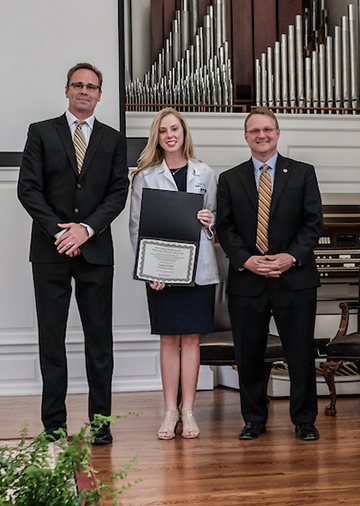 Samford University’s McWhorter School of Pharmacy honored 111 third-year students at the recent professional pinning ceremony. The annual event recognizes students as they make the transition from a predominately classroom environment to advanced pharmacy practice experience. It is a testament to how Samford ensures lasting success through steadfast adherence to its mission of preparing pharmacies who transform lives. Patrick Devereux, a 2005 Samford pharmacy alumnus, and incoming president and chief executive officer of FMS Pharmacy, provided the keynote address. Devereux challenged students to find excellence in the ordinary. During the ceremony, the school also presented two of its highest honors. Third-year pharmacy student Angela O’Neil is this year’s recipient of the Cardinal Health Annual Independent Pharmacy Scholarship. Established in 2012 by Cardinal Health, the award provides a full-tuition scholarship for the final year of pharmacy school. Cardinal Health’s vice president for independent sales Chris Lanctot was present to make the announcement. “Take this opportunity to do good for your patients in the future,” Lanctot told O’Neil. Professor Pamela Sims was this year’s recipient of the Margaret Self Propst Pharmacy Teacher of the Year Award. Crouch said this is the highest teaching honor given by McWhorter School of Pharmacy. “[Sims] is one of those people who always sees the bright side of a situation, and she never fails to amaze the class with the wealth of knowledge she is lecturing on without a single note in her hand,” Couch said, reading student comments.